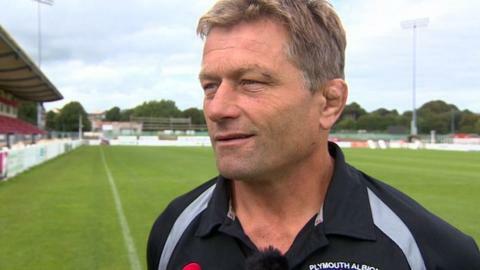 Plymouth Albion's financial worries are not over, according to director of rugby Graham Dawe. The club is preparing for its first match in National One when they host Richmond on Saturday. "We need to be on alert," Dawe said about the club's finances. "It's a business which relies on people coming through the gates." Falling attendances contributed to the club's financial issues last season, with the club averaging 1,700 fans to each game, down from just over 1,900 the season before. "Supporters coming through the gate and spending money on food and drinks is what's going to drive a successful sports team," Dawe told BBC Radio Devon. "But it's a big city, there's lots of people with rugby history, and we just hope we can produce a brand of rugby which they enjoy."